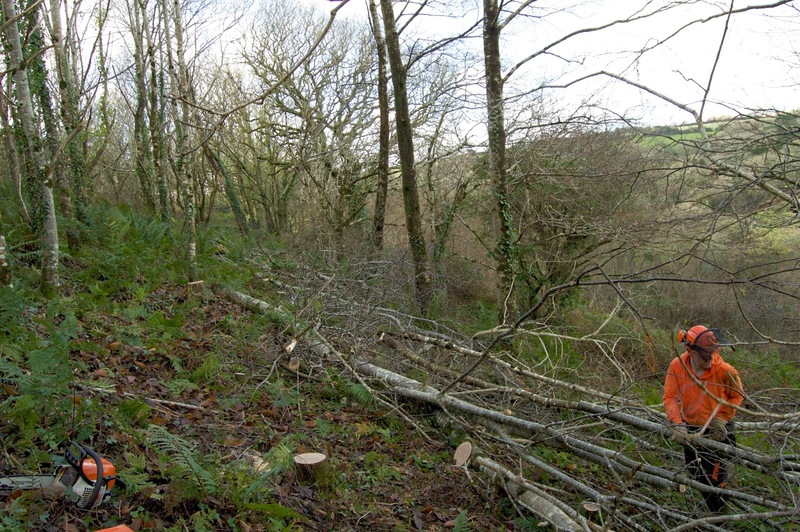 Last week I cut the first section of coppice in the woodland. Having no experience of this before I employed the help of a friend who is a seasoned coppicer to see me through the first season and make sure I was doing things correctly. 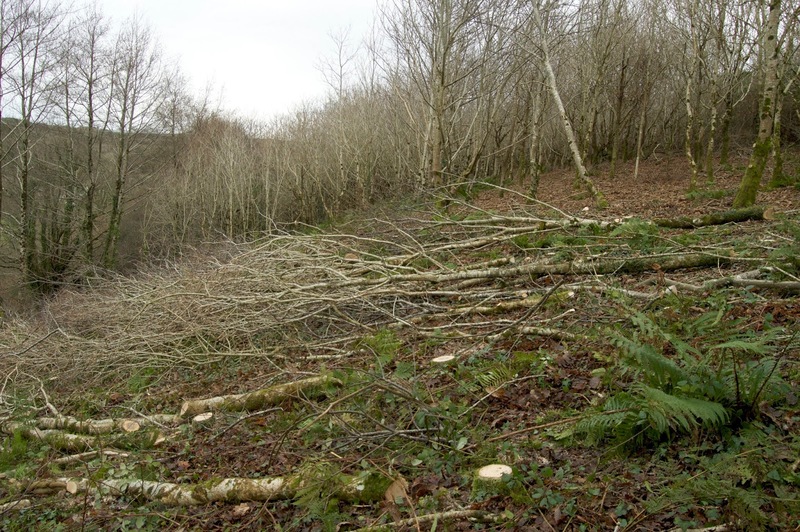 What is coppicing? A lot of people are not familiar with this practice which has been employed for thousands of years in Britain and other temperate regions, so an explanation is in order. 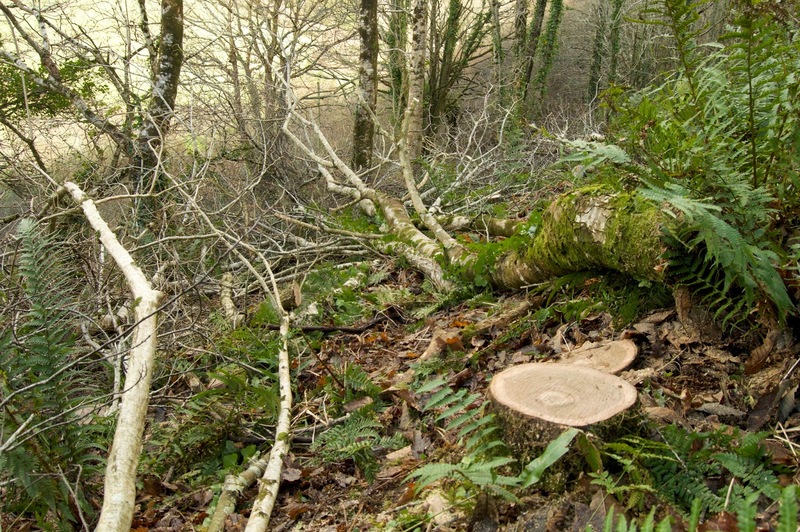 Coppicing is simply the act of cutting down certain species of hardwood trees, such as oak, hazel, chestnut and ash, while they are still young enough to regenerate. This is done in the winter, when the ‘life force’ of the trees has retreated down into the root systems. 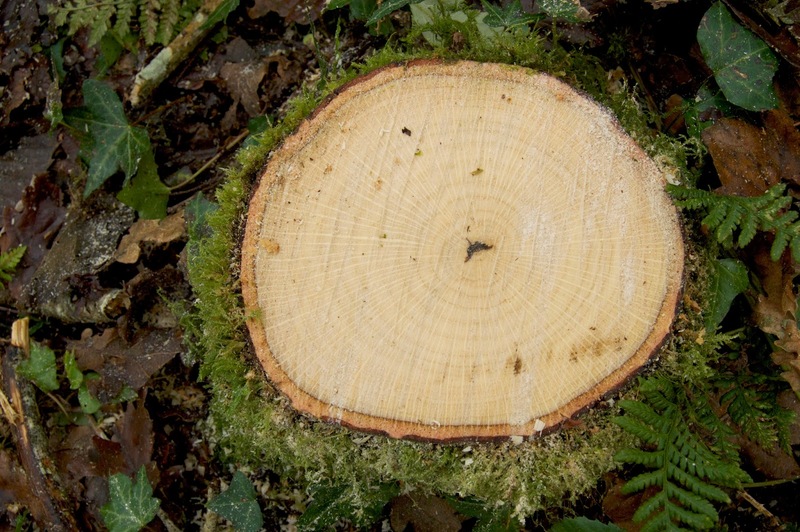 By cutting off the trunks at between 3 and 6 inches the tree stumps will start sprouting shoots when Spring returns. These shoots are then protected and allowed to grow, and in another 12 years I will be back to cut them off again – although next time there will be four or five stems instead of one. When I first bought Fox Wood just over a year ago, it was an abandoned coppice wood with brambles growing everywhere and some of the trees in a derelict state. The woods were planted about 25 years ago when it was part of the local estate – the Trevarno Estate – which was a big local landowner with family ties stretching back hundreds of years. Locals say it used to be full of pheasants which ‘gentlemen’ would periodically come along and shoot as they were flushed out by drivers. The estate went bust and was sold to a Russian oligarch (so I’m told) and the small parcels of woodland were sold off to individual buyers. Fox Wood is about six acres, with a two acre field attached. 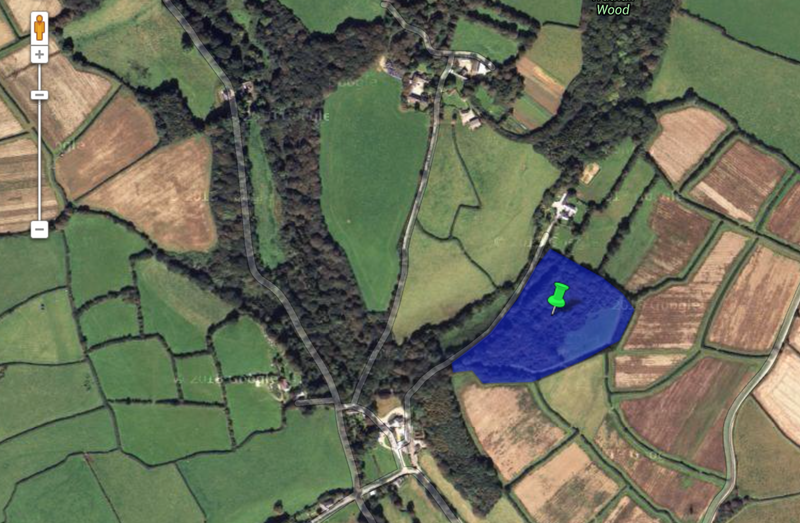 You can see it shaded in blue of the Google map image below. Work has not yet finished on the coppice this year. The next thing I need to do is make some tracks for a horse to pull the logs into the field. Until I know exactly what to do with the wood I need to keep the trunks as long as is reasonably possible. The maxim is ‘Keep it as long as you can for as long as you can’. If I cut it all into short lengths I might miss up the opportunity of selling it as building materials. A friend knows someone with a horse trained to extract wood, so hopefully I will be able to borrow it for a day. Once the wood has been extracted then I need to surround the whole area with fencing. This will be quite a big job and pricey too. I have never seen a deer in the area but locals say there are a few muntjac (a small Chinese deer) roaming around. If a deer were to graze on the new shoots in the Spring then this would be disastrous and might result in the death of all the trees. Therefore deer fencing has to be erected. Rabbits are another problem. There are hundreds of them in and around the woodland and so I will need to put up a rabbit-proof fence and dig it into the ground all around. Unfortunately, the problem doesn’t stop there: there are rabbits actually living inside the area that will be fenced off. Thus, I need to contact a local known as ‘the ferret man’. He will come over with his ferret and put it down the rabbit holes. The rabbits will then be chased out and into nets, where they will meet their end. I’m told he will accept payment in rabbits, so it won’t cost me anything. Unfortunately, due to laws preventing people from living in the woods they manage it is necessary to erect high fences to protect the new coppice. In times past the woodlander would have been able to erect his bender within the coppice and thus keep away any deer, which have an acute sense of smell. I’m told they are scared off by the smell of human urine and so will be encouraging any people working in the woods to head to the boundary when they feel the call of nature. The reason the coppice is cut in large sections is to let in light. If we were just to cut a few trees every here and there the canopy would soon close over the stumps and no light would be available for the new shoots. They would die. By cutting half an acre at a time light is allowed to flood in and all of the stumps can regenerate at the same rate. To most people it looks like environmental devastation – but in fact it is quite the opposite. The trees have been planted relatively close together to encourage them to compete for the light. This makes them grow straight, and it also makes them grow quickly. 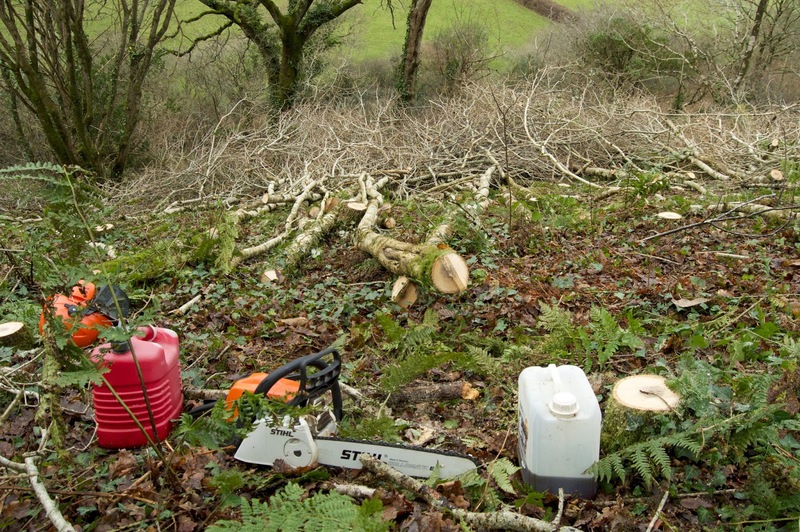 The actual work of coppicing was done with chainsaws. In the right hands these are invaluable tools and can save a huge amount of time. I expect chainsaws to be used even when oil is in short supply, but eventually their use will probably fizzle out and people will have to revert to the old ways of cutting wood. The two-man bow saw is the best tool in this respect, and I’ve heard reports that they can be almost as fast a chainsaw – although you’d have to have a very fit and strong individual on each end of it! In twelve years, when I come to coppice this section again, there will be five times as much work as each stump will have sprouted multiple trunks. In their uncut state the young trees are called maidens and their trunks can often be twisted and gnarly. The new growth will be a lot straighter and easier to work with, but for now I have a lot of maiden trunks to put in the wood store. What will I do with them? Selling them as long logs for construction is the easiest way to make money out of them – but also the least profitable. The more processing I can do, the more I will earn. As a bare minimum I will be cutting them into lengths approximately six feet long and then splitting them lengthways with a tool called a froe. A froe is a bit like an axe that you hammer down through the grain of the wood. These split pieces of chestnut can be sold or used as fence palings. Myself and another woodland neighbour are building a large coop in which to keep chickens, so quite a few of these will be used for that. But generally speaking, most of the wood from this year’s coppice will be used for construction projects on my own land, including raised beds, a wood store, a compost toilet and Hugelkultur beds. Other pieces will be sold to various local greenwood craftspeople I’ve got to know since we started up a coppice and woodland skills network in the local area (more on that in another post). Some will be sawn up as logs for our own use and for sale. With the price of natural gas and electricity increasing so much, many people are installing wood burners to heat their homes, and the price of logs is rising in response. It’s something of a waste to use a high quality wood such as chestnut or oak for fuel, so I will try to minimise this and use only the small diameter branches. I’ll probably also make bundles of faggots, which will burn well in our new wood burner that is due to be connected to the central heating system in our house this summer. I will also be making charcoal using an old oil drum with many of the offcuts later in the year. Wood is also a de facto currency. I have many offers of people willing to work on the land for a day in return for a car boot full of logs. The woodland effectively pays for itself. What’s more, I’ve planted around 150 young trees, including a few birch which will be used for firewood and making birch sap wine. I will have a further 300 oak saplings planted from seed to use in hedges or sell to other people establishing woodlands. Whatever wood is left will sit and season in the woodshed. I haven’t built the woodshed yet, but it’s on my list of jobs to do in 2014. One of the many good things about chestnut and oak is that the natural tannins in the wood preserve it for up to 50 years without the need to treat it with chemicals. I can build my woodshed at leisure in the spring or summer. In the meantime I will continue to learn more greenwood skills so that I can increase the value of my wood products. Ben Law, in his excellent book The Woodland Way, says that you can increase the value of your wood 800% by making bespoke green wood furniture, gates and other things. This is something I fully intend to do. I’ve already been taught how to make a long bow (see below) – so making my own shave horse is another job for this year. Working in a woodland setting has to be one of the most enjoyable ways to make a living. It seems incredible that this time last year I was sitting at a desk in a city and dreaming of doing what I am doing now. 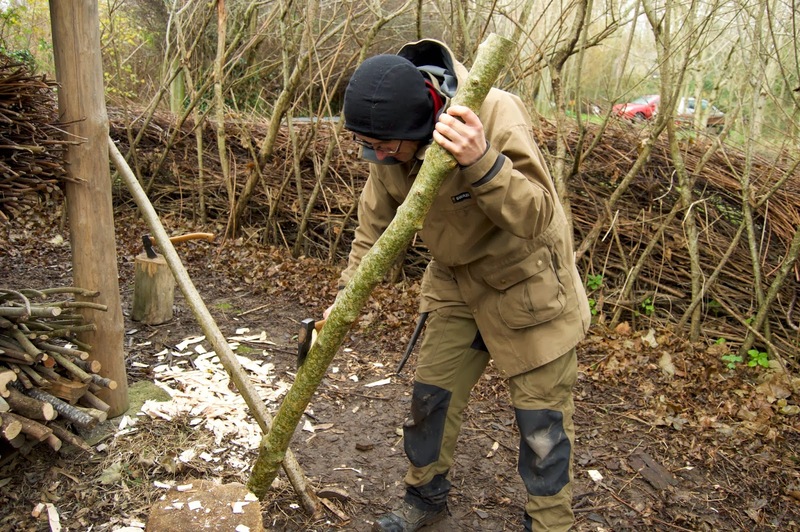 I see coppicing as one of the most sustainable ways to make a living. 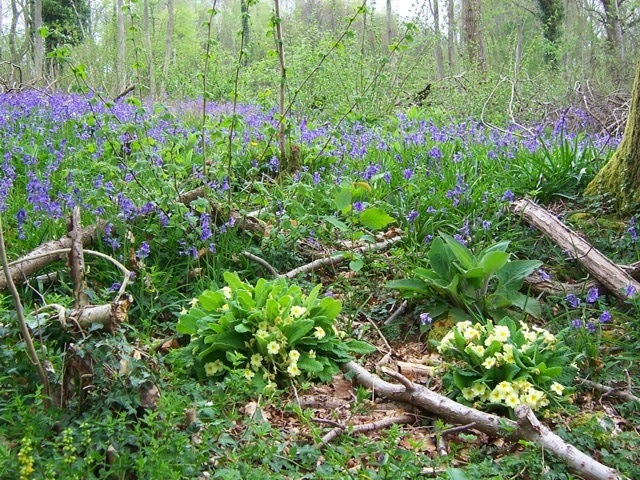 Woodland can be bought quite cheaply, compared to agricultural land, and trees require very little maintenance. They just grow! In today’s industrial system woodland is undervalued quite substantially and is priced in terms of the extractable timber. This represents quite an opportunity for anyone looking to make a sustainable living. Even a patch of old spruce or fir is packed with opportunities. The conifers can be cut down and used as construction materials or firewood while you plant up the cleared area with broadleaf species – and it doesn’t need to be that big, two or three acres or more should be plenty (see this, for example). And despite what I wrote above, there are ways in which you can perfectly legally live in your woodland. 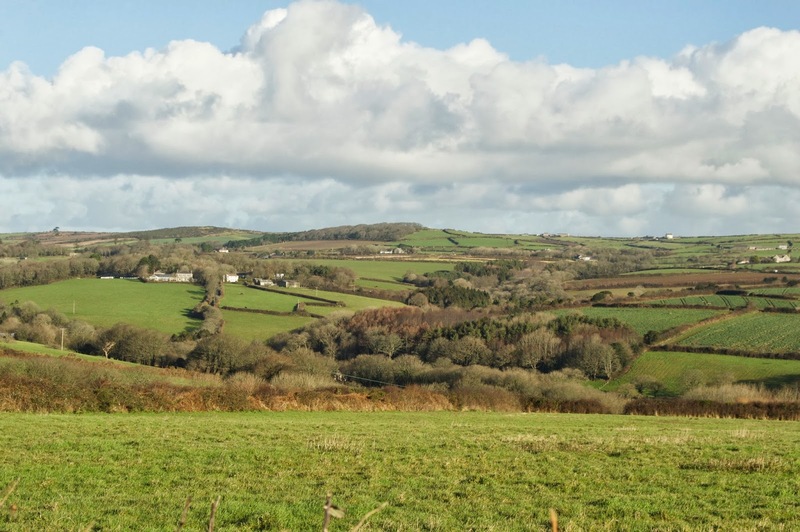 You’ll have to be quite inventive to start with, but the law will either have to change or it will break down soon enough as planning departments struggle with cut backs and are overwhelmed with people inventively living on their own land. There can’t be many easier ways to capture the sun’s energy and turn it into useful products. Furthermore, by clearing glades you can plant forest gardens to grow annual vegetables, fruit and nut trees and many other things that will provide for a subsistence living. People are an important part of the woodland ecology and I look forward to the day when the woods are filled with people again, harvesting timber, making products and burning charcoal. That is truly a future to look forward to.